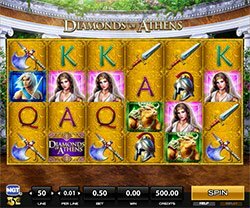 Explore the ancient kingdom of Greece in the awesome 50-line Diamonds of Athens slot online from IGT and H5G! In this game you'll be set off on a thrilling adventure to recover the most coveted jewels in Athens. With an embracing backdrop full of mythological symbols and creatures, the game has 6-reels instead of the normal 5, and 4-rows to give you a total of 24 symbols showing at one instead of the typical 15. Explore the ancient kingdom of Greece in the awesome 50-line Diamonds of Athens slot online from IGT and H5G! In this game you’ll be set off on a thrilling adventure to recover the most coveted jewels in Athens. With an embracing backdrop full of mythological symbols and creatures, the game has 6-reels instead of the normal 5, and 4-rows to give you a total of 24 symbols showing at one instead of the typical 15. In an epic battle, you’ll be trying to rescue the diamonds of the ancient Grecian empire. You’ll have a few special symbols and features to help you along your way too. This game showcases the Super Stacks feature where full stacks of the same symbol can appear on the same reel for huge wins. You can also win up to 16 free spins in the bonus rounds. On the reels you’ll find a Queen, a warrior, a gladiator and a Minotaur, as well as symbols like a helmet, sword, battle axe and card symbols queen through ace. Diamonds of Athens Wilds – The Game’s logo is the wild and will substitute for all other symbols in the game to complete winning combinations when possible! Super Stacks – Super Stacks reels contain stacks of mystery symbols that transform into one of many other symbols including the game’s logo, any of the four characters of the game, the three weapons and the card symbols. All stacked mystery symbol positions on a reel transform into the same symbol! Free Games – To win free spins you’ll need to land 12, 13, 14, 15 or 16 Diamond symbols anywhere on the reels to win 12, 13, 14, 15 or 16 free spins respectively. The Diamond symbols appear on reels 2, 3, 4 and 5 only.